The 1982-1993 Mustang GT Registry, founded in January 1994, is dedicated to the documentation and preservation of the 1982-1993 Mustang GT. As one of the very first Mustang registries on the internet in March 1996, we are considered by many to be the authoritative source for info on third generation Mustang GT's. We are enthusiastic, long-time Mustang GT owners and Ford Mustang fanatics holding the belief that these cars are well on the way to becoming the next generation of desirable collector cars. Our goal is to build an extensive computer database containing production information, details on individual cars, and documentation of production variances, etc. to aid in future restorations and for future reference as these cars move into collector status. Our primary focus is on collecting data from these cars (VIN’s, door tag and buck tag info, window stickers, build sheets, histories, etc.). The information we accumulate from this endeavor will be very helpful when the time comes to restore these cars as they continue to move into collector-car status. As we get more and more 1982-1993 Mustang GT’s registered, we will be able to analyze the data and report production trends, variances, etc. to you. 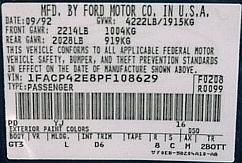 We are also working to build an expansive collection of factory and other literature related to 1982-1993 Mustang GT's, detailed photos of original/unrestored cars to aid in restoration efforts, as well as copies of documentation such as window stickers, factory invoices, build sheets, etc. In addition to all of this, we want to provide a place for GT owners to meet other owners to ask questions and a place to provide other specific year-by-year information for these cars. In short, our ultimate goal is to become a "one-stop-shop" for everything related to 1982-1993 Mustang GT's. Of course, the more cars we can get registered and the more documentation we can collect on these cars, the better!! Please encourage any other 1982-1993 Mustang GT owners you know to register their Mustang GT’s in our database. In addition, we also encourage you to collect information from any 1982-1993 Mustang GT's you run across (in the junkyard, at car shows, from the internet, etc.) and submit it to us! If you belong to a Mustang club, we would appreciate it if you would pass on the word to fellow club members. Evolving from its humble beginnings in 1982 to the hard-charging street performer of 1993, the third generation Ford Mustang GT has gained respect as one of the most versatile and popular Mustangs of all time. Back in its day, the 1982-1993 Mustang GT was notable for ushering in a new era in performance after the preceding decade of anemic, under-performing pony cars. 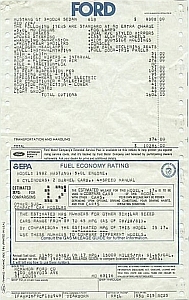 More than 450,000 of these cars were produced over the span of twelve years. The 1982-1993 Mustang GT has an unbelievable following of young and old alike and are equally at home drag racing, open tracking, auto-crossing, basking in the sun at a car show, cruising or just serving as daily transportation. Most importantly, these cars are still simply fun to drive!! There is phenomenal support from the aftermarket with hundreds of aftermarket performance parts available to turn a run-of-the-mill Mustang GT into a wild pony. Vendors are also now starting to make available an ever expanding number of restoration parts for these cars. There has also been an increasing amount of interest in restoring Mustang GT’s to original, factory condition to compete in Mustang Club of America national and regional car shows in the concours judged categories. Pristine, original examples of these cars are becoming harder and harder to find and are highly sought after by collectors. Because of this, they are starting to command premium prices in the market. We feel that the third generation Mustang GT is destined to join its classic Mustang ancestors as one of the most popular cars in American history. We created the GT Registry in January 1994 because of our love for the cars and our desire to help out other like-minded enthusiasts. We are enthusiastic, long-time Mustang GT owners and Ford Mustang fanatics. Over the last 30 years, we have owned only Ford products including twelve Mustangs, a 1983 Thunderbird Turbo Coupe and a bunch of other daily drivers (yes, we bleed Ford blue!). Mustangs we have enjoyed owning in the past include a 1966 coupe (David's first Mustang), 1968 High Country Special, 1970 Boss 302, 1985 GT hatchback with T-Tops, another 1985 GT hatchback, 1988 GT hatchback and 1989 LX 5.0L sedan. Our current stable of Mustangs includes our 1965 coupe (restored and in the family since 1983) as well as our 4 matching Ultra Blue/Titanium Mustang GT's - our 1991 hatchback (owned since 1991) and 1991 convertible, our oldest daughter's 1992 hatchback and our youngest daughter's 1991 hatchback. Of course, our "still-want-to-own" list of Mustangs is WAY too long to mention here!! We thoroughly enjoy ALL aspects of the Mustang hobby including restoration, open track, auto-crossing, drag racing, showing, cruising, collecting memorabilia and documentation, etc. We have had a blast participating in open track events with our 1991 Mustang GT at awesome places like Road America and Charlotte Motor Speedway, have shown our Mustangs at many Mustang Club of America (MCA) National and Regional concours car shows and have participated in Shelby American Automobile Club events with our Mustangs. We also have a great time taking all of our Mustangs to local cruise nights. We especially have fun when we can take the 1982-1993 Mustang GT Registry "on-the-road" to events such as the big MCA Mustang Anniversary Celebrations and other big Mustang events. It is a great way to meet other GT owners and spread the word about the 1982-1993 Mustang GT Registry! !